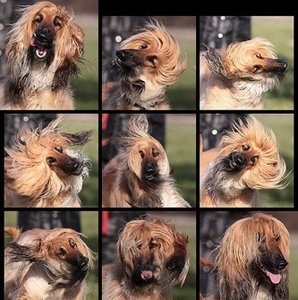 The body shake is one of the most easily recognized body signals or doggy vocabulary words for owners to see and hear. 1. You’ve just returned home. After 30 seconds or a minute of your petting- and love-filled reunion, does your dog offer a body shake? 2. If your dog is an alarm barker, watch the next time he does his job of telling the mailman to stay away. Does he body shake once he’s harassed the dutiful government worker? 3. After your super social dog meets another dog on the street while on leash, does he body shake as you walk away? 4. Grab your dog’s leash, ask your dog to sit and clip on his leash like usual. When he pops back up after the leash is attached, does he body shake? 5. After a play session with playmate elevates, you will see the dogs briefly stop playing, maybe walk away from one another and shake off. If you start watching, it is very likely that your offers a body shake during some of the above situations. Why? All of these things are arousing. They can be exciting, intense, and even stressful depending on the setting and circumstances.The body shake is a doggy calming mechanism. It may be offered when your dog is excited and working to settle himself or it can be after something has startled or overwhelmed him. In the video below, I give Luna some intense and exciting loving. Maybe a bit too intense?